QUESTION: Mr. Armstrong; I greatly appreciate the mere fact that you cover the Russian markets when nobody does. It is really incredible that your computer can write so much and there is no fear of bias or policial slant. Socrates just wrote, “At this moment, this market is in a downward trend on all our indicators looking at the weekly level.” There has been a panic taking place here with stocks crashing on the news of asset confiscation. You mentioned that your model will predict war correlating all the markets. Is this what is beginning with the crash? ANSWER: Yes. 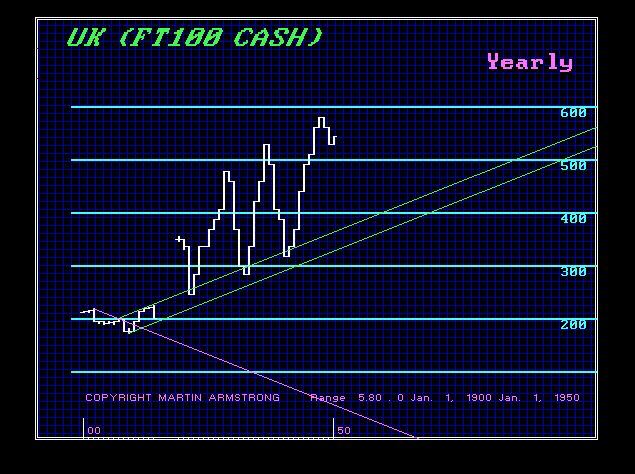 Here is a chart of the British share market as World War I began. There, the market began to display inherent weakness. It could not get through the top of the channel and as soon as the previous year’s low broke, the market crashed. They then closed the market completely so many people lost all liquidity. We must fear that Europe will do the same. The EU does not like free markets. They have outlawed short government bonds. They are trying to seize the market in the Euro from London because they want to manipulate the currency and will try to prevent a currency crash with the stroke of a pen. Europe remains deeply in danger of a liquidity crisis. If you have money all parked in Europe, you may find it of little use in a crisis. 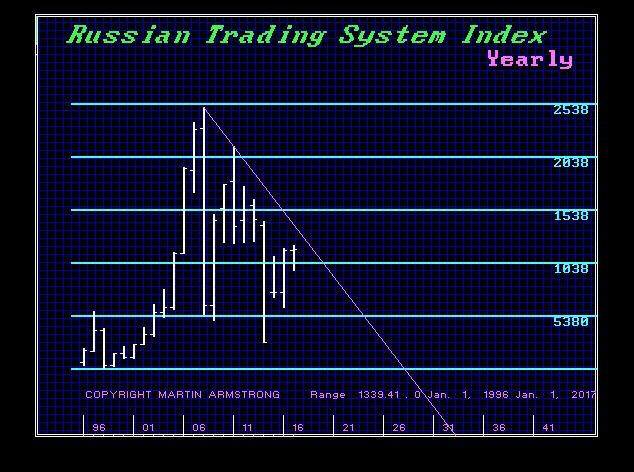 The immediate crash in Russia was caused by investors in Moscow dumping Russian shares and the ruble following the announcement that the West wanted to confiscate Russian assets abroad. The ruble depreciated by nearly 3% against the dollar. The United States imposed sanctions on Russia for interference in the 2016 US presidential campaign, which is something they do to everyone else from Canada all the way to Russia. Hillary has turned Russia bashing into a national sport. This is clearly leading to a confrontation for the West desperately needs a war to divert attention from the failure of social program promises. The Russian government will retaliate against the tightened US sanctions. Clearly, the actions of the Congress are unjustified and intended to provoke a confrontation. We are on the path to war and every opportunity to further that goal is clearly being taken by the USA, UK, and the EU. « The Coming Pi Target – Will it Bring World War III?